So let’s go to Josh and see what MyCounselor Says. When someone we care about is in an EMOTIONALLY DESTRUCTIVE relationship. It’s like watching a train wreck in slow motion. Approach the situation and be helpful to this person that seems unable to make decisions that would be best for them in their situation. And first of all, I want to encourage you to continue to be a friend. I know that that is a difficult thing to do when you’re in that situation, it’s easy to feel frustrated and the distance yourself. smaller steps. Oftentimes the decisions that a person is facing that feel overwhelming and just impossible for them to make our paralyzing to them. And so they do nothing. Or they just stay in what they know in the in the situation or relationship that’s unhealthy. And so rather than expecting them to be able to make all the choices that they need to make are the big choices that they need to make and to make them now. She might start with encouraging them to mix take smaller steps that will help them identify the things that are getting in the way of them being able to make the bigger decisions as well as provide the support and direction for them. So some of those smaller steps might look like picking up and reading a book by Leslie Vernick. It has a wonderful book called The EMOTIONALLY DESTRUCTIVE relationship. 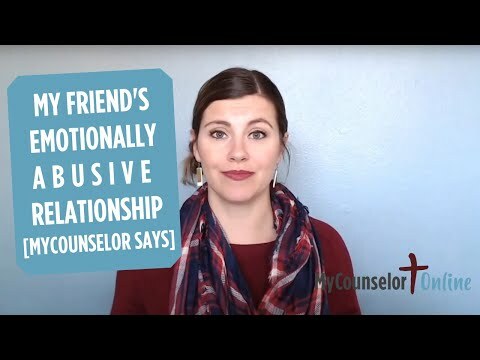 That is geared towards helping them individual identify the elements of an EMOTIONALLY DESTRUCTIVE relationship and being very practical and how to go about Engaging and getting out of a situation like that, or thinking through the decisions that need to be made along the way, in a relationship like that. Leslie also has some great support groups online. I think there are a Facebook page where you can get into a closed group. EMOTIONALLY DESTRUCTIVE relationships. So sometimes the decision to to read a book is a lot easier decision to make them to leave a relationship. And so it’s a starting place you might also engage a local support group at like a Celebrate Recovery. Or living free. Or something like that. That’s a church base support system that can allow the person to process through their own dynamics or maybe codependency that’s a part of the picture for them. That’s getting in the way of them making decisions that would be good for them and maybe engaging counseling to be able to get into the details of their life that maybe are creating obstacles for them from making the good decisions that you would hope to see for your friend. Thank you Jess and Josh. And if you have a question you can ask one of our awesome therapists by submitting your question to our MyCounselorSays page. Then I will track them down. Have a an online meeting with them like this and we will post that up on our MyCounselor Says page as well as an upcoming edition of our weekly e newsletter. So you can look for it there. MyCounselor Says – Ask your question here!